Versatile Film Director and Script Writer Vasantha Obeysekere breathed his last on 8 April. Vasantha, born on 29 December 1937, was 79 years of age when he passed away peacefully in Colombo. In a creative career that spanned nearly five decades, Vasantha made 13 feature films and several documentaries. He won many accolades and awards at multiple levels for his films. Most of his creations were commercial successes too – satisfying both the connoisseur as well as the common rasika. More importantly, Vasantha was an intrepid and innovative director who went off the beaten track and ventured into new vistas of filmmaking. His films possessed distinctive hallmarks indicative of his unique directorial style. The landmark movies made by Vasantha Obeysekere comprised a baker’s dozen. His films in chronological order are ‘Vesgaththo’ (Masked Men), ‘Valmathuwo’ (Lost Ones), ‘Diyamanthi’ (Diamonds), ‘Palangetiyo’ (Grass Hoppers), ‘Dadayama’ (The Hunt), ‘Kedapathaka Chaya’ (Reflections in a Mirror), ‘Maruthaya’ (The Storm), ‘Dorakda Marawa’ (Death at the Doorstep), ‘Theertha Yathra’ (Pilgrimage), ‘Salelu Warama’ (Web of Love), ‘Asani Warsha’ (Wrath & Rain), ‘Sewwandi’ (Chrysanthemum) and ‘Aganthukaya’ (The Outcast). An inevitable (and at times unnecessary) question that arises after the demise of a great filmmaker is – which was the best work of his many creations? In the case of Vasantha Obeysekere too, the question is – which was his Magnum Opus or Masterpiece movie? Different people have different answers. My choice is ‘Dadayama’ or The Hunt – his fifth film released in 1983. 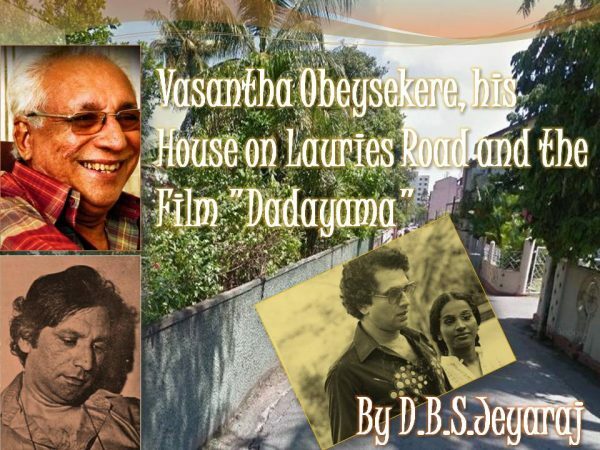 A large number of persons ranging from writer and critic Regi Siriwardena to popular actress Swarna Mallawarachchi have opined that ‘Dadayama’ is indeed Vasantha’s best creation. It is in this context that ‘Spotlight’ intends focusing this week on ‘Dadayama’. The film was an artistic triumph and commercial success. However there is another sentimental reason also for me to write about Vasantha and ‘Dadayama’. Of all the film directors I came to know in Sri Lanka, Vasantha Obeysekere was the one I was closest to. There was a warm friendship between both of us during the years 1983 to 1988. Our friendship began in 1983 when I first met him and continued until 1988 when I left Lanka for North America. We lost touch thereafter. By a quirk of fate our friendship began evolving in 1983 thanks to the film ‘Dadayama’ and my friend and fellow journalist on ‘The Island,’ Ajith Samaranayake. What happened then was that Vasantha Obeysekere’s masterpiece ‘Dadayama’ had been released in 1983 a few months before ‘Black July’ and was running to packed houses. Ajith and I went to see it one evening after engaging in a hunt of our own at the ‘Spotted Deer’ in Fort. When we went to the Regal Theatre, the show had already started running to a full house. Furthermore, tickets to the next show were also sold out. There were long line ups of ticket holders waiting to see the next show of the film. The chances of seeing the film that evening or night were extremely remote. Suddenly Ajith had a bright idea. “If we can’t see the film, then let’s go and see the Director!” he said. Ajith Samaranayake, who wrote insightful film reviews, had met Vasantha Obeysekere after ‘Palangetiyo’ and both had become firm friends. So acting upon a whimsical impulse, Ajith and I went to see the director at his Lauries Road residence which was being used as an office then. Vasantha was pleasantly surprised to see us and gleefully delighted when we told him, “We came to see the Director because the theatre was house full and we couldn’t see the film.” I was made most welcome by Vasantha who told me that he read my column ‘Behind the Cadjan Curtain’ in the ‘Sunday Island’ regularly and was looking forward to a discussion on the ethnic issue. I still remember Vasantha telephoning home and saying he would be late because he was going to discuss some serious issues with two journalists from ‘The Island’. We then went to the Bamba junction and procured solids and liquids necessary to nourish and enliven a spirited discussion. The conversation continued into the wee hours of the morning. At one stage Vasantha said the mood in the country was bad and that anti-Tamil violence on a large scale could be unleashed if a major incident happened in the north. This was some weeks before July 1983. Seeing the expression on my face, Vasantha leaned over and in a silent, sensitive gesture exuding empathy put his arm around my shoulder. I was touched and warmed to him instantly. Vasantha and I became close friends thereafter. I was a bachelor then and would often enjoy his and wife Swarna’s hospitality and sleep over at night in his house situated amidst picturesque surroundings by the Bolgoda Lake. Instead of showering in the bathroom, we would bathe in the open air, drawing water with rope and bucket from the well he had on his premises. I would play with his children Asanga and Kanishka who were very young at that time. I would also fool around with his dogs of contrasting sizes, a Great Dane and a Pomeranian. In later years Vasantha started living alone in his Lauries Road residence at Bambalapitiya due to personal reasons. His Assistant Director Christy Shelton Fernando from Narammala would also stay there when in Colombo. Vasantha’s Production Manager at that time Hapugoda was a regular visitor. I too used to stay with Vasantha at Lauries Road on weekends, extending at times to mid-week. I would telephone people from his phone and write up my news stories and articles sitting at his table. We would get up in the morning as birds chirped and have kola kenda and kiribath for breakfast from a kade nearby. We would buy and drink king coconuts from a street vendor at noon. Lunch came from a home in the vicinity. It was always rice with the traditional parippu (dhal), mallung (leafy vegetable) and karawala (dried fish), etc. In the evenings if there were no guests, we would go to ‘Wadiya’ on the beachfront and talk of many, many things. We would sip our drinks watching the sun disappear slowly on the horizon.We would chat on with the moon glowing, listening to the lashing waves. Dinner (usually late) would be in one of the restaurants at Bambalapitiya junction specialising in Muslim and Malay style cooking. Those days at the house on Lauries Road were happy times indeed! I also met a lot of people connected to the Sinhala film industry in those days. There would be a steady stream of visitors comprising actors, technicians, writers and budding filmmakers at Vasantha’s place. I would be lying on the bed reading but Vasantha would soon call me out and introduce me. The conversations were generally full of humour. I remember actor Roy Jayawardena the son of sophisticated screen villain Dommie Jayawardena relate tales about his father particularly Dommie’s ‘romance’ with South Indian actress G. Varalaxmi. I also recall meeting the ace Film Director Prasanna Vithanage for the first time at Vasantha’s place. Prasanna was in his twenties then and had not directed a film. It was Prasanna who reminded me that we had first met at Vasantha’s house when I saw him in Toronto some years ago when he came for the 2008 TIFF to screen ‘Machan,’ which he co-produced. Vasantha filmed several documentaries in the years in between ‘Dadayama’ and ‘Kedapathaka Chaya’. They were made for the International Centre for Ethnic Studies (ICES) and the Law and Society Trust (LST) in Colombo. The documentaries were commissioned by Dr. Neelan Tiruchelvam and dealt with themes such as devolution of power, students and the ethnic crisis, ethnic relations and the plight of remanded prisoners. I too got a chance to see at first-hand how Vasantha worked when some of these documentaries were filmed. I was also involved with Vasantha when the documentaries were dubbed in Tamil helping out with some of the translations and voice-overs. Vasantha at work was totally different to the Vasantha after work. He was a strict disciplinarian and would not allow strong drink to be imbibed while working. Fun and frolic was only at home after work. Vasantha liked the A.M. Rajah song ‘Unnai Kandu Naan Vaada’ from C.V. Sridhar’s first Tamil film ‘Kalyanaparisu’. I never knew why. He would often ask me to sing it and clink his glass rhythmically. In October 1987 I was arrested and detained by the Police on the fourth floor after I returned from Jaffna and exposed the misdeeds of the Indian Army. Many of my friends and journalistic colleagues came to see me but were denied access. I remember the CID officers and other Police personnel being excited and intrigued by two of the visitors. One was Richard de Zoysa and the other was Vasantha Obeysekere. The cops kept on asking me how I knew both. My stock rose on the fourth floor thanks to Richard and Vasantha. My intermittent periods of stay with Vasantha at his Lauries Road house were some of the happiest days in my life. I enjoyed chatting with Vasantha and his film friends about movies and movie making. They were practitioners of the art and craft of filmmaking while I was only an ardent aficionado of cinema. I learnt a lot from those conversations. Alas! All good things must come to an end. In my case it was my departure to the US after I received a Nieman fellowship at Harvard University that caused the finale. When I left Sri Lanka in 1988 I was very sure that I would return home in a year. We made plans about what we were going to do then. One idea was for me to accompany Vasantha full time when he was directing a feature film and then write a book about how the film was made. The other was to work on a project jointly with Vasantha to make a film based on the ethnic issue.Vasantha was keen on doing a film based on a true incident or incidents tr;sting to the ethnic crisis. Unfortunately those ‘best-laid plans’ went awry. I did not return to Lanka but relocated to Canada instead. He was very disappointed. Gradually our contact diminished and ceased. However those happy memories have not diminished and will never cease. It is against this backdrop therefore that I am writing about ‘Dadayama’. As stated earlier, I regard the film as Vasantha’s masterpiece (though I must admit I have not seen all his films). 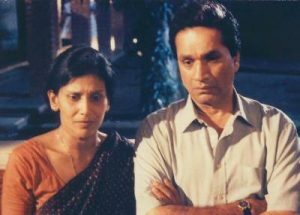 The awards that were bestowed upon the film nationally and internationally, the positive reviews written by knowledgeable critics, the laurels heaped upon the artistes and others involved in the film and the popularity it enjoyed then (and still does) among fans are all reasons enough for writing about ‘Dadayama’. There is also the additional quixotic reason of the film being indirectly instrumental in my making the acquaintance of its Director Vasantha Obeysekere. Vasantha Obeysekere was at one time a journalist at ‘Lake House,’ covering the crime beat and writing human interest stories. Many of the stories he filmed had their genesis in true incidents of life. These true tales inspired or influenced Vasantha to weave wonderful film scripts out of them. The screenplay and dialogues in their final form would be completely different to that of the original incident. Apart from being the spark that ignited creative flames in the filmmaker, the actual incident would be far removed from the audio-visual spectacle on screen. This tendency was very much apparent in ‘Dadayama’. What inspired Vasantha Obeyesekere to make ‘Dadayama’ and how he set about it is a fascinating tale. I heard it from the horse’s mouth itself while chatting with the Director at his Lauries Road abode but am able to recollect only snatches now. Vasantha’s ‘Dadayama’ story was inspired by a murder which happened in 1959. On the night of 14 March 1959, the body of a young woman was found lying at Thimbiriwewa close to the Wilpattu National Park near the 27th milepost on the stretch of road between Puttalam and Anuradhapura. Passers-by saw the body and alerted authorities about what seemed to be a hit-and-run accident. The identity of the dead woman was unknown. Fortunately for the cause of justice, the post-mortem was conducted by the forensic analysis expert, Dr. W.D.L. Fernando, who was the Colombo JMO at that time. After careful examination conducted on 16 March 1959, Dr. Fernando concluded that the victim had been killed due to injuries caused by a motor vehicle. However Dr. Fernando opined that while the injuries on the woman’s body were consistent with her being run over by a motor vehicle, there were also serious injuries on her head that were not caused by a motor vehicle. The post-mortem also revealed that the woman was between 20 to 25 years of age and was about seven months pregnant at the time of death. Since the victim was not from the area where she was found, identifying the body became a problem but Forensic Odontology came to the rescue. It was found during the autopsy that there was a large cavity in the woman’s lower jaw. The skull and lower jaw of the victim were separated from the body and taken to Colombo. The oral cavity was further examined and found to have been caused by dental treatment. This was traced to the Kandy Dental Clinic where treatment had been obtained for an abscessed tooth. A superimposition of the skull and jaw with an enlarged photograph of the victim resulted in a match. The victim was identified as Adeline Vitharana. This enabled the Police sleuths investigating the murder to make a breakthrough. A man living hundreds of miles away from the scene of death had visited and re-visited the spot twice on the following days. The man was a wealthy schoolmaster named Jayalal Anandagoda. He was found to be acquainted with Adeline Vitharana and arrested on suspicion. While being interrogated by the Police on 22 March 1959, Anandagoda admitted to having killed Adeline Vitharana by beating her unconscious and placing her body on the road and then running over her body twice in a car to make it appear that she was the victim of a motor accident. He was aided and abetted by two others. Both of them were also arrested. Anandagoda and the other two were charged with the murder and conspiracy to murder Adeline Vitharana. The case for the prosecution was that Jayalal Anandagoda had had a clandestine love affair with Adeline Vitharana as a result of which the woman was pregnant. She wanted formal marriage. Wanting to wriggle out of his responsibilities. Anandagoda decided to kill her. Consequently Anandagoda with two others had rendered Adeline unconscious, thrown her on the road and then killed her by running over her body twice in a car. It was a murder most foul and Jayalal Anandagoda was convicted after trial in 1960 in what became infamous as the Wilpattu murder case. Subsequently Jayalal Anandagoda appealed against the conviction all the way up to the Privy Council. The Privy Council dismissed the appeal in 1962. Vasantha was an undergrad at Peradeniya when the murder trial went on. He was very much interested and followed details of the proceedings published in newspapers. Later while working at Lake House, Vasantha obtained typed copies of many newspaper clippings of the Wilpattu murder trial. He had those copies with him at Bambalapitiya even after ‘Dadayama’ was released. Vasantha let me read some of the English newspaper reports. Most of them were written by veteran scribe William de Alwis, the son of legendary journalist R.E. de Alwis. 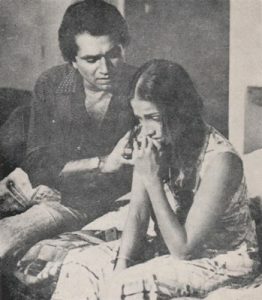 Though Vasantha was very much interested in the story of Adeline Vitharana’s murder and the trial of Jayalal Anandagoda, the script he wrote for ‘Dadayama’ was not based entirely on that. 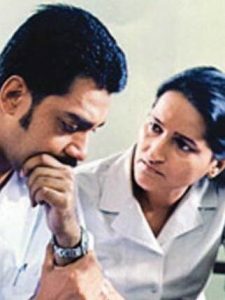 The trial inspired Vasantha to write a brilliant screenplay that differed in many respects from the true life incident. Of course there was a common rudimentary basis as well as superficial similarities between both but the film narrative had the unique imprimatur of Vasantha Obeysekere written all over it. In fact when the film was being made Vasantha cautioned artistes not to read the book written by former Judge A.C. Alles about the Wilpattu murder trial saying his film was different to the book and that he did not want his actors to be influenced by the book. Vasantha Obeysekere inspired by the Adeline Vitharana murder wrote the first draft of a film script for ‘Dadayama’ before he made ‘Diyamanthi’ in 1978 but revised and polished it after ‘Palangetiyo’ was released in 1979. ‘Palangetiyo’ won national and international acclaim. Vasantha Obeysekere had arrived! He now wanted to make a film in colour for the first time and thought ‘Dadayama’ would be suitable. He got the film script approved by the National film Corporation as required at that time and began seeking finances for production. Earlier Vasantha had sold a five-acre property he inherited to make ‘Diyamanthi,’ but now to make a colour film like ‘Dadayama’ a large amount of cash was required. Despite the kudos he had gained as an award-winning director of notable films after ‘Palangetiyo,’ Vasantha faced difficulties in procuring finances or finding a producer to film ‘Dadayama’. Maestro Lester James Peries had faced the same problem in earlier times. Now it was Vasantha’s turn. Many were ready to finance a film but they wanted a typical formula film or masala movie that would be a money spinner drawing huge crowds. Some wanted ‘Dadayama’ to be filmed as a crime thriller with steamy love scenes. Vasantha refused to compromise in any way and waited hopefully for a producer or financier on the same wavelength as himself on ‘Dadayama’. Dramatists at times resort to a plot device with its roots in classical Greek tragedies known as ‘Deus ex Machina,’ meaning God from the machine. This is when a seemingly intractable problem blocks the smooth flow of the narrative and requires the unexpected intervention of a new event or character to resolve the problem and make the story progress. Vasantha Obeysekere’s Deus ex Machina in the case of Dadayama was a creative Sri Lankan who was ready to put his money where his mouth was. His name was Rabin Chandrasiri. Rabin Chandrasiri was an old student of Dharmasoka College in Ambalangoda and had been a surveyor in Government service. He had left Government service and gone to Saudi Arabia where he worked for some years as a Survey party chief. He returned home in 1981. Chandrasiri was a film buff from childhood. It was his lifelong ambition to produce a film. While in Saudi Arabia he had written a story and script for a film of his own. Chandrasiri was highly impressed by ‘Palangetiyo’. He contacted Vasantha Obeysekere to seek his advice and help on producing a film of his own. While conversing Vasantha told him about ‘Dadayama’ and that the film script had already been approved by the Film Corporation. Rabin read the script and loved it. He was ready to produce ‘Dadayama’ and let Vasantha have a completely free hand in directing it. Chandrasiri’s bold investment in ‘Dadayama’ paid huge dividends when the film did well at the box office while winning many awards. The Producer himself was the proud recipient of the Best Picture Trophy at the 1984 Presidential Film Awards. Decades later Rabin Chandrasiri proved his mettle as a filmmaker by directing an award-winning movie himself. The film was ‘Patibana’ (perception) for which Rabin Chandrasiri won the Best Director Award at the 2015 SAARC film festival. Thus Vasantha Obeysekere got the green-light from Rabin Chandrasiri to go ahead with ‘Dadayama’. He selected the artistes and technicians and scouted around for locations. Ravindra Randeniya and Swarna Malawarachchi were selected as the lead pair. 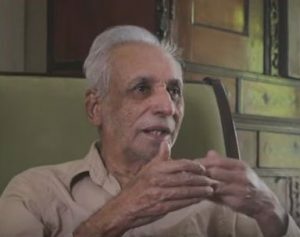 Donald Karunaratne was the cinematographer. Khemadasa master was to compose the music. Since Chandrasiri hailed from the Ruhunu, the bulk of the shooting was done in the Southern Province, particularly Ambalangoda. The climax scene was shot in Hambantota. 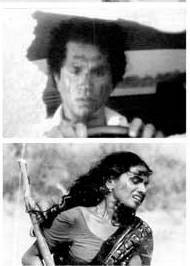 The making of ‘Dadayama’ as a movie and the impact it had on Sri Lankan cinema is a powerful tale worth relating in depth. In a bid to refresh my memory about ‘Dadayama,’ I spoke with Ravindra Randeniya and Swarna Mallawarachchi on the telephone. Both artistes were very receptive and spoke at length about their experiences and shared their memories of ‘Dadayama’. ‘Spotlight’ will continue shining brightly on Vasantha Obeysekere’s masterpiece ‘Dadayama’ next week.